3. Dark Chocolate (1/2 pound) - you could use other types of chocolate. If you really like dark chocolate, make sure to use a kind that doesn't list sugar as the first ingredient. P.S. - I'm not big into measuring things... for this recipe I just determine how much I need of everything as I go. The amounts above are "min" amounts meaning if you have at least that much of everything, it should be enough. You'll need a few pans and/or bowls to transfer the nuts. I just use a medium sized pan for melting the chocolate, two round cake pans for dispersing the cocoa (have at least one that is wide with high sides + a lid that will cover it), and a bowl to put the finished product in. A fork and slotted spoon are also helpful. I recommend you have all of these things ready before you get started. Hmm... in "Carrie Time" about an hour or so. So for everyone else, maybe 30-45 minutes. STEP 1: Prepare cocoa, sea salt, and sugar mixture. Just mix it all up in that wide pan or bowl I mentioned earlier. STEP 3: Add the nuts! Coat completely in chocolate. STEP 4: Give your trusty side-kick some attention. STEP 5: Coat nuts in cocoa. STEP 6: Drizzle melted chocolate over nuts and mix with hands. Add more sugar/salt if desired. STEP 1: Prepare cocoa, sea salt, and sugar mixture. Just mix it all up in that wide pan or bowl I mentioned earlier. Add however much sea salt and sugar you want. I start with a little, then add more as desired after adding a couple nuts and trying them out. These nuts are great even without the sugar - you can even wait and just sprinkle it on the nuts at the end for a nice finishing touch. And too much salt can ruin them, so be careful! Optional time-saving approach: You're going to put the chocolate covered nuts into this mixture soon... if you want to take a different approach that will save you some time, you can put this mixture into a large plastic bag or container with lid, then add all of the nuts at once and shake it up. You'll end up losing some of your chocolate that way and risk having your nuts clump together. If you don't have any fancy chocolate melting mechanisms, just do it in a pan on low-medium heat and stir frequently until melted. Once completely melted, remove from heat. STEP 3: Add the nuts! BTW, ever heard of aflatoxins? If not, Google it... make sure your almonds don't have any obvious mold on them. Coat the nuts completely in the chocolate. For extra chocolaty nuts, you could coat once, let them dry (put in fridge to speed up the process), then coat again. I don't have the patience for that so I just do it once. Make sure your cocoa/salt/sugar mixture is evenly dispersed in your pan. Take each chocolate covered nut and place into the mixture, oooone at a tiiiiime. I use a fork to transfer the nuts. It takes a minute, but that is the best way to ensure they don't clump together. If you come up with a more creative way that makes this process a little less time consuming and also keeps the nuts from sticking together, please share! I put the "wet" nuts into a round baking pan, insert nuts until no room is left but to where they aren't touching each other, cover with a lid, then shake them up. Repeat process. After transferring all nuts to the cocoa mixture, save the leftover melted chocolate. During this process, if your trusty side-kick happens to be a dog, avoid giving them any of the tasty ingredients, even if they give you this look as if they haven't eaten in months. STEP 6: Drizzle melted chocolate over nuts and mix with hands. 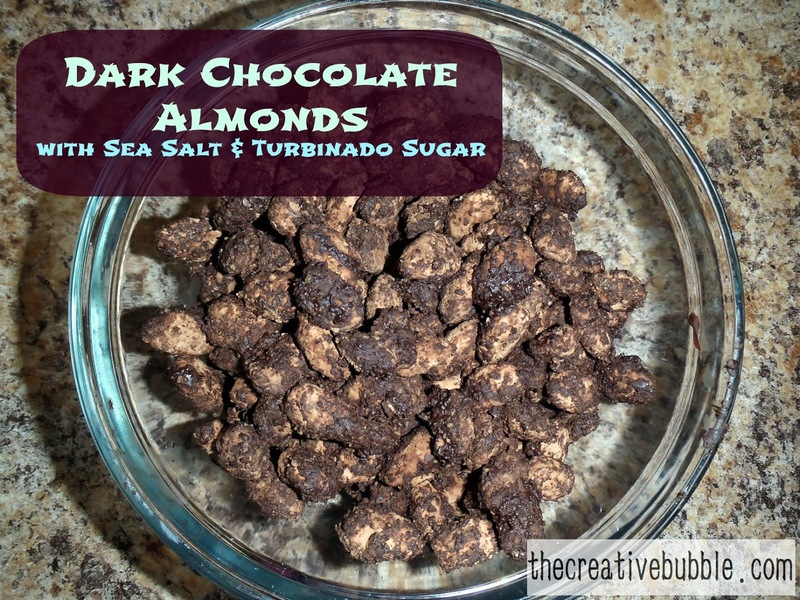 Take your leftover melted chocolate (you could melt more if needed) and drizzle it all over your cocoa covered nuts. I drizzle a pretty generous amount and try to get a little on each nut. Then use your hands (or a spoon if you don't want to get your hands dirty, but hands are better) and mix up the chocolate onto the nuts until coated to your desired level of chocolatyness. Try to keep your nuts from sticking together. You can add more sea salt and/or turbinado sugar at this point. I transfer them to a new bowl, then put them in the fridge for about 5 minutes so they harden. The finished product is below. These have been a big hit with all of my taste testers. TIP: Try to resist eating them all at once (seriously, they have a lot of fiber). This is something I will definitely try! I found your website because of Todd Starnes on Facebook! Have a blessed week. Stop by my Fireplace Decorating Blog anytime!